Rockmen R2: Dr. Wily's Restart!! 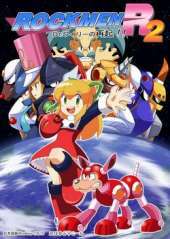 This is a Japanese Doujin-soft fangame based on Mega Man that stars Roll, and features a unique cast of Robot Masters as well as a new robot called Piano. With the success of Roll, the Wily corps was destroyed and hidden. And the second Robot Championship was held to train Robot development engineers against Wily. When the opening ceremony, the old man of the investor got up to the stage and ordered, the guards Robot began to rampage. Defeating the fleeting silence, Wily again took over the world conquest. It features a brand-new cast of Robot Masters and some friends from the past. The new Robot Masters were built or modified by Dr. Wily.